The table lamp is built with a sandblasted bent aluminium tube and a cylindrical metal foot. Will also be available in anodized colors. HAHA is a design company that creates, develops and produces unique one of a kind design furniture and accessories. HAHA’s work is very much focused on the combinations between physical shapes and it’s unexpected connections in order to create poetic yet distinct designs. 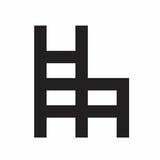 "We at HAHA believe that design should be looked upon as a tool of improving ones mind and body. 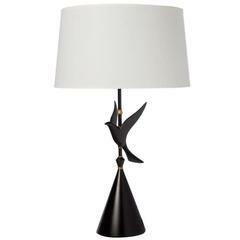 It’s an essential part of our lives, and should be treated with great respect and attention"
Black aluminium dove lamp with wood cone base and brass hardware by Rembrandt Lamp Company, circa 1960. Original glass diffuser included. A small French aluminium lamp (labeled: made in France) in the manner of Morellet.